"I'm trying Paleo — gluten-free wasn't for me." American culture has long grappled with rationalizing eating for pleasure with eating for longevity. How we think about and understand nutrition and our bodies is changing. Part of the major shifts we’re seeing in the food and beverage market is the emergence of new, more nuanced health and wellness goals within the everyday American diet and mainstream consumers who are hungry for guidance and direction. Hard-core wellness consumers focus on the specifics of nutrient density and customized diets to maximize energy, performance and digestion. Nearly every consumer today has some kind of dieting ideology (or system of ideas and ideals) that they currently practice. Whether vegetarian, Paleo, flexitarian or gluten-free, American eating habits today are much more nutritionally intentional than in a former era composed largely of short-term crash diets, silver-bullet products and eating to "look good." Americans manage a slightly broader set of physical concerns with their diet than in the past. In the food lexicon of many consumers, “dieting,” as it once was known in the 1950s, is now regarded as pretty shallow. This is driven by a more nuanced, self-aware view of how our bodies age and how they function. Healthy-eating approaches reflect a desire to reexamine fundamental nutritional needs and seek out solutions in more pure, less deleterious forms. Contemporary diets are personalized and all about balance, wellness and energy. Wellness and energy are shorthand for feeling lighter, better digestion, reducing inflammation and ultimately feeling good and being happy. Diet cults need not despair: our cultural love for experimenting with eating styles and ideologies has hardly waned, and Americans still careen in and out of different ways of eating with abandon. The Hartman Group’s Health and Wellness 2015 report finds that about one-third (32 percent) of adults have tried various approaches to eating and dieting in the past year, ranging from vegetarian (9 percent) to Paleo (3 percent) to locavore (1 percent). Specialized dietary approaches are used not only in a quest for wellness, energy and weight management; many dieting styles serve as a way for consumers to experiment with culinary variety, treating diets as cuisines that satisfy their curiosity as they seek new or interesting food and beverage experiences. This means that “being a vegetarian,” for example, is not at all a prerequisite for eating vegetarian at least some of the time. Consumers move in and out of different diet approaches to manage their eating and address their current needs. 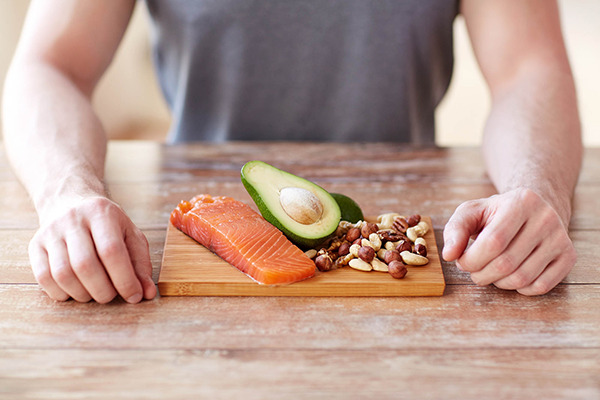 While some regard periodic diet switching as a matter of trial and error, others prefer flexibility and rotate through part-time diets that may include spurts of fasting, detox cleanses or “going vegan” for a certain number of days. Millennials are the most open to trying different eating ideologies: more than four in ten (44 percent) say they have tried a new approach in the past year. Clues from how the most active health and wellness consumers "diet" today provide glimpses of eating practices that are likely to have long-term effects on the larger population. Redefining what is tasty and considering "flavor per calorie"
Forward-looking food retailers and manufacturers should be aware that many of the nutritionally driven diets popular today (e.g., Paleo, plant-based, gluten-free, vegetarian) signal new consumer appreciation and curiosity about ingredients formerly vilified (e.g., "fat") as well as entire categories of products (e.g., vegetarian, natural sweeteners). Active health and wellness consumers, for example, are keen on good fat and are stocking up on lard from natural food co-ops, rendering their own duck fat and eating fries cooked in chicken fat at hip eateries like Seattle’s Damn the Weather. “Fructose-free” may be a new callout as fructose is being linked to hormone disruption, elevated triglycerides and elevated blood sugar by progressive health and wellness consumers. Such consumers believe that there’s a possible connection between artificial sweeteners and potential increased health risks, which has some rethinking the benefits of “sugar-free." Instead, active health and wellness consumers are opting for unsweetened, minimally sweetened with real sugar and natural alternatives (e.g., stevia and monk fruit). Staying conversant with dieting trends will no doubt have payoffs down the road since many of the dieting behaviors embraced by active health and wellness consumers are diffusing into the mainstream. Trend-focused and quick-to-act marketers know that opportunities abound for innovative private label products at retail. Meatless products from Wegmans and Target reflect fun and flavor compared with the asceticism of traditional meatless products. 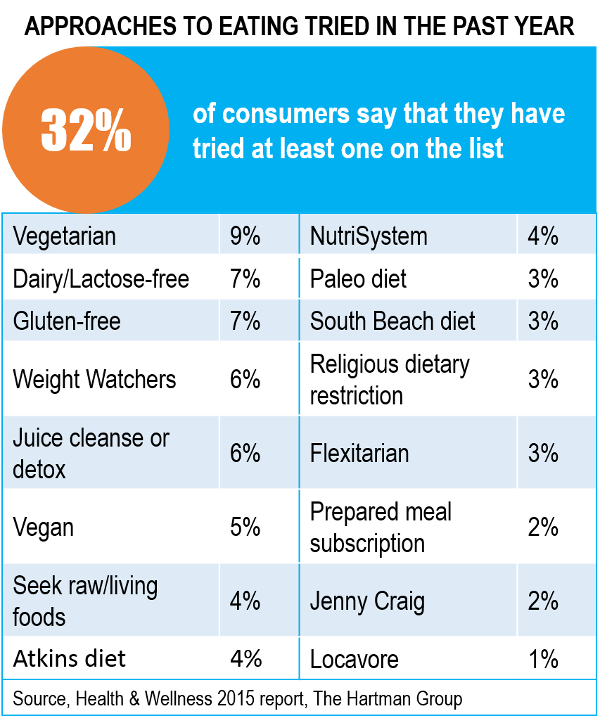 In branded food and beverage CPG, many emerging and popular new brands are reading the tea leaves of dieting trends and are developing products that are plant-based, nutritionally dense, vegetarian or digestion friendly.